When a person screws up we call it human nature. So what does it mean when a machine that’s trying to imitate our intelligence makes a mistake? According to the doomsayers, it means robots could attack us because of faulty reasoning – and that’s scary. But, it’s hard to fear a machine that can be defeated with tropical fruit. That’s why we’ve gathered some of the best robot fails we could find to remind everyone we’re still in charge. For starters, who could forget the Boston Dynamics’ Atlas robot demonstration? The company showed off its new technology at The Congress of Future Science and Technology Leaders, where everything was going well at first — then the robot tried to go offstage. Yikes. It bears mentioning that, at the point when the machine fell, it was being operated manually by a human. Still, for one of the world’s most advanced machines, it’s a bit hilarious that all it takes to send it head over heels is an ill-placed extension cord. Sometimes robots fail because they escape from their captors and run freely through the streets jamming traffic — which seems a bit like a fail on the programmers part. That is, until we find out the escaped machine immediately ran out of battery power in the middle of the street and thwarted its own getaway attempt. And sometimes robots are less than successful because, obviously they need to update the prescription in their glasses. The machine in the next video seems to be experiencing a problem with its depth-perception, no word on whether it’d been drinking or not. Of course, few people can make a robot (or anything else for that matter) fail like the government. Here’s some DARPA fail-bots having a hard time getting anything accomplished – proving they’re just like your average human government worker. 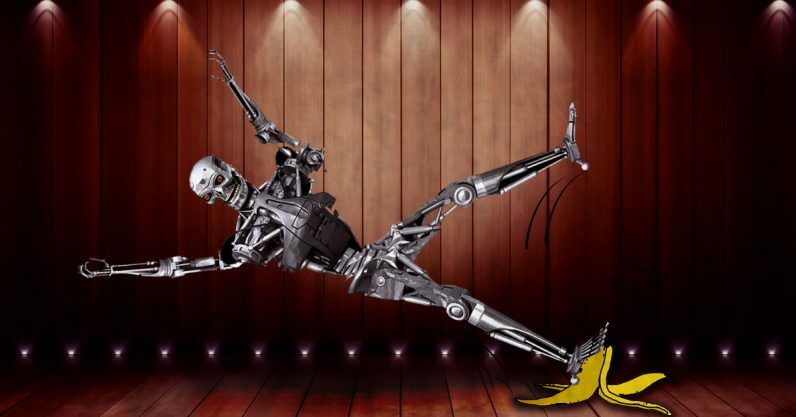 But our favorite, and perhaps the most reassuring of all, is Boston Dynamics’ spooky-agile dog robot’s inability to overcome the most cartoon-esque of foils: the common banana peel. Sometimes it’s nice to know that, despite all the hullabaloo, robots are still dumb hunks of matter that can barely make it a day without embarrassing themselves – just like us.